Since 1918 the Auclair family philosophy has always been to purchase the freshest and best cuts of meat available, and to provide to our customers service, quality, and value. At Auclair’s Market you will find both self service and full service meat display counters, staffed by our knowledgeable and friendly meat department personnel and meat cutters. Our staff is ready to assist you with your special cut, special order, and culinary questions if needed. Auclair’s Market is registered to sell Certified Angus Beef (CAB), which is always U.S.D.A. Choice or higher in grade, well marbleized, flavorful, and tender. Visit www.certifiedangusbeef.com for more information. The pork we sell is Western grain fed. We sell a large variety of fresh poultry, such as: Pilgrim’s Pride, Purdue, and Allen’s. We are also happy to offer our customers all natural Smart Chicken brand poultry. Our meat department personnel can be a great help when entertaining family and friends for the holidays or any special occasion. We can suggest to you the type and size of a special cut, and offer cooking suggestions if needed. Some of the special cuts we are famous for are: Beef Rib Roast (Bone-in, or Boneless), Top Sirloin, Triple M Buda Ball Ham, a large selection of boneless hams, Geese, Ducks, Farm Fresh Turkeys, and our very special Gray Corned Beef. Our reputation is not limited to quality and service. Our meat department is well known for our store made products such as: Our Pub Burgers plain or flavored and our own specialty Italian Sausage. 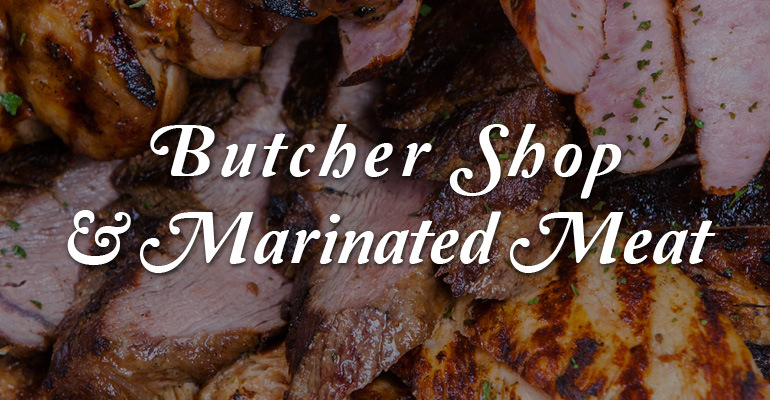 Our famous marinated meat products have also been a local favorite for over 25 years! For your convenience our marinated meat products are packaged and ready for your grille! We now carry an assortment of our own Antibiotic Free Poultry. Our chicken comes from Springer Mountain Farms and is 100% All Natural, No Steroids, No Growth Stimulants or Hormones, and also is produced with NO Antibiotics, Never Fed Animal By-Products, and are American Humane Association Certified.